The day of the mini App Day event. Helped by the local Mozillians, I made an introduction about Firefox OS and Web Technologies (slides) and then it was time to start creating apps. Some of the participants were already familiarized with the webapps ecosystem and started to code. For the rest, we used the step by step presentation of Shafiul Azam Chowdhury on how to build a very simple webapp. After a short break for lunch, the workshop continued. Some new people came in and with our guidance started to experiment with webapps. At the end of the first day we showcased the results. I was surprised by the creative and smart ideas behind the webapps and how some of them have used the WebAPIs or other components like pdf.js. There were 9 apps and as a guest, I had the honor to choose the top three that would get a prize. I hope to see all these wonderful webapps available online soon. During the day, members of the Mozilla India community arrived in Pune and joined us at the App Day event. It was nice to meet again friends. The highlight of the first day was my contact with the Aakash 2 tablet and my attempt to flash Firefox OS to it (more details will follow on other post). 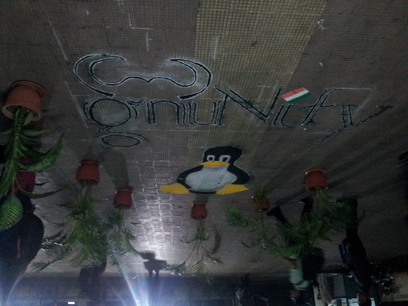 The weekend came and more people joined the GNUnify event. At the Mozilla room we had several presentations and each of them was crowded. Many people were interested to get involved and hopefully more of them will join the Mozilla Community. At the end of the day, when all the Indian Mozillians were at Pune, we had a pre-meetup session to talk about the community. This was a good lead-in at the next day's community meetup. The highlight of the second day was the drinks and the dinner together with the Mozilla India community at the Marriot Hotel viewing from height the magnificent Pune city at night. Why did you choose Mozilla to contribute? On what do you work at Mozilla? and also making a SWOT analysis. The second part, after the lunch break, was about several points on the meetup etherpad and discussing about the SWOT analysis results. One of the most important points was to assign roles inside the community in order to be more effective, more organized and help new contributors to get involved more easily. What I liked most on this community meetup was the fact that it was open to everyone. People outside the community were able to watch, participate and see how the community works. The meetup was very interesting and we were the last participants who left the GNUnify event, of course after many group, and not only, photos. After that it followed a relaxing dinner and a great Indian movie, I didn't understand the language but I fully enjoyed it. It was very nice to meeting the Mozillians from India, I had the chance to talk with most of them and I believe that there is a large potential for great things to heppen in the future. Finally I want to thank everyone for this experience and especially the Mozillians from Pune for their awesome hospitality!